ByteScout team launched new online applications, take a quick check! Question to SQL is a smart tool to improve your SQL skills and to practice SQL language mastering. It is based on our extensive database of SQL queries with relative deep SQL examples. The Question to SQL online app is speedy and well-performing with a simple developer-friendly interface. You may type any sentence in the program straight away and get a neat response with a SQL query. Learn even more by checking the SQL samples below the input question field. If used regularly, the online SQL learning tool will help you train and make SQL programming skills better. 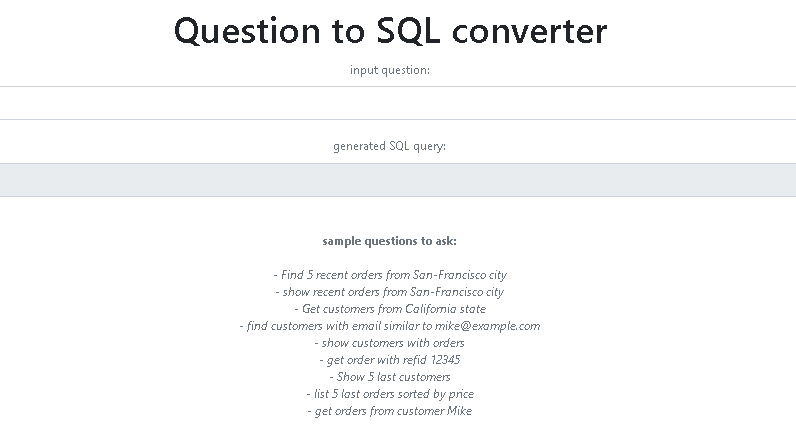 Our SQL question converter is for those SQL users looking to improve their programming skills and become more efficient with the language of SQL. Thanks to the open question input, you will be well on your way of learning how to code in SQL quickly. What SQL language elements exist? There are several elements that make up the foundation of SQL language including but not limited to: clauses, expressions, predicates, queries, and statements. They are all executed through a specific SQL command-line interface (abbreviated CLI). Clauses are components of both statements and queries. Expressions produce scalar tables or values consisting of columns and rows of data. Predicates specify conditions, which in turn allows the user to limit the effects of any statement or query and/or change the program flow. Queries allow the retrieval of data based on a given criterion. Statements control program flow, transactions, sessions, diagnostics, and connections. They send queries from a client program to a server that responds by processing the SQL statements and returning a reply to the client program. It is essential for large, simple (or complicated) and fast data manipulation operations. As mentioned, queries are solely responsible for pulling data based on any specifications from a database. They are the most commonly used SQL language element. Clauses and statements help make queries more specific to what the user wishes to retrieve from the database. The use of SQL queries requires an understanding of the local relational database for it to be used correctly. The SQL App features a user-friendly interface that gives you clear and comprehensive guidance. Both beginners and more advanced SQL learners will find it helpful. Some examples of different commands that can be used with SQL queries are SELECT, WHERE, LIMIT, GROUP BY, MIN/MAX, AVG, and SUM. Other commands may also be used. Each command line regulates the behavior in how the system will find a response to an associated question. In other words, your use of them should be determined by the type of information you are trying to find, delete or analyze. Our SQL App will allow you to mix and match open questions, modifying each question to serve your purpose, and find out if you did the science correctly by either receiving a response or a notification to make a change due to an error. This trial and error method will allow you to work on your own terms and pinpoint exactly what you need to do further study in. Practical online practice allows you as a user to elevate your SQL knowledge and abilities. ByteScout SQL open question converter is a perfect SQL tool that will provide you with firsthand manipulation of database queries with no risk factors. Practice SQL online and learn SQL on your own time with our SQL query application. We keep working with new tools prototypes and development. We’d like to provide the best of the best for our programmers. If you feel it is useful for you, please leave us some feedback. Enjoy ByteScout free Question to SQL app and other tools. Even more are coming soon!